Quarterly update – 10 random learnings – Live MoHo! As part of my first quarterly report series of top ten lists, here are 10 random things (plus a few bonus ones) that I’ve learned. Most of us hate the scale. But you need to put your MoHo on one. The good news is that it is easy! 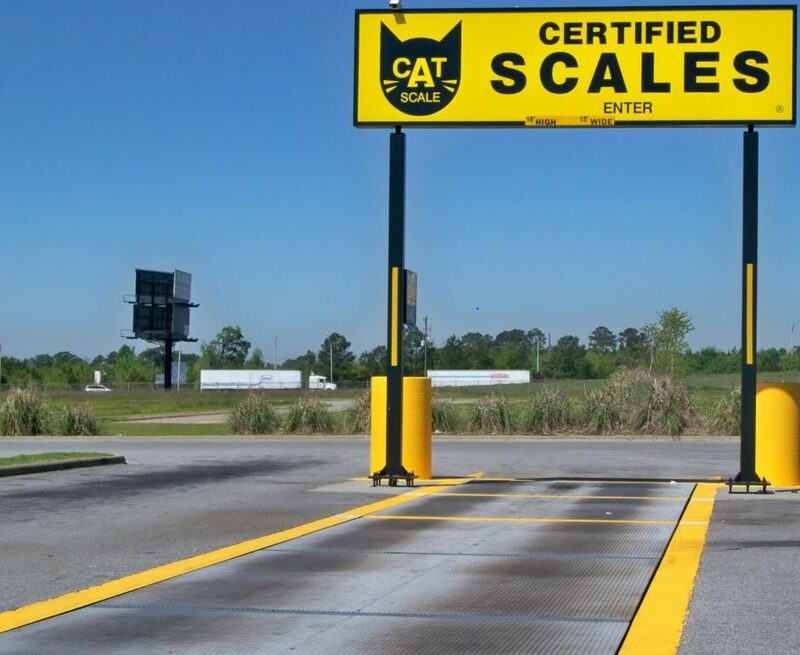 Just go to a Flying J with a CAT scale. They’ll have a big sign letting you know if they do. Drive around back where the scale is located. Pull onto the scale and hit the intercom button. Tell them you want to weigh, just for your own information. They’ll weigh you. Pull off the scale and park with the big rigs. Go inside, pay your $10, and get a printed sheet with the weights of each of your axles. Now you will know if your MoHo is over capacity on any of the axles and it will give you critically important information on how to set your tire pressures! You do not want to be overloaded on your axles, especially your front axle!! Also, do this with your MoHo loaded as it will be for travel. Put your clothes in it. Your dishes. Fill the refrigerator. Bring the beach chairs. And fill the holding tanks to the level you expect to fill them for travel. Or even a bit more, just to be safe. Fill up the fuel and propane tanks. Make it your worst-case scenario. So many people drive around in overloaded MoHo’s on under or over – inflated tires. Don’t be one of them. Once you get your tires set to the proper pressure, keep them there! Check your tire pressure every time you set out, or even better, get a wireless tire pressure monitoring system! Blowouts in a MoHo can be catastrophic. Washer/dryer is quite possibly the single best option in a full-time MoHo. 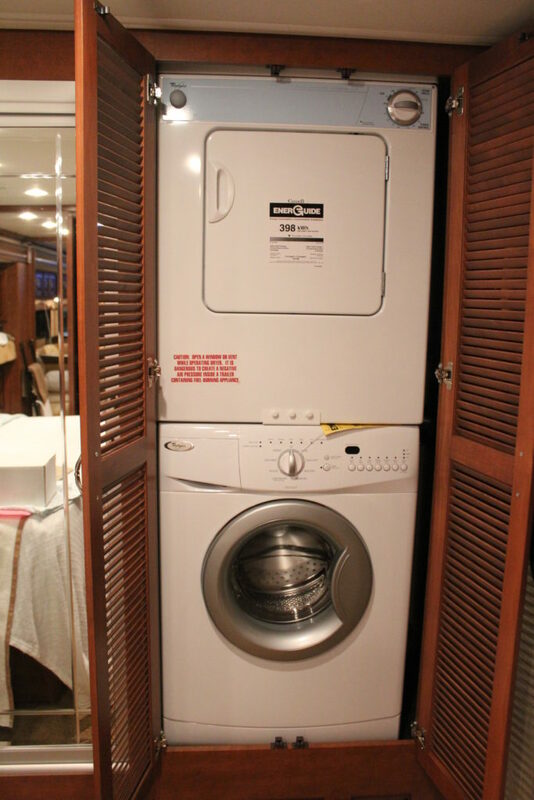 Sure, most campgrounds have coin-operated washers and dryers. The same ones that get used for every oil-soaked rag, sand-filled swimsuit, and gum-stained shoe that owners would never wash in their own washing machine. Think about it. If your neighbor yaks on your shirt after a little too much fun at happy hour (which is more like 6 hours at most campgrounds), are you gonna take that shirt to your washing machine? No way. You’ll probably just burn it. But if you don’t you’ll go to the campground washing machine to wash the shirt. And then you will burn it. So you get to spend a lot of money using ratty equipment with questionable cleanliness? No way. We can do laundry like normal people, in our own house on our own time. Let me put it another way. In the evening, you DO want to be streaming Game of Thrones on HBO go with a coconut flavored drink in your hand. Preferably while in your underwear. (No judgement!) You DO NOT want to be trapsing across the RV campground with laundry baskets. Especially in your underwear. And you’ll probably spill your drink. Trust us on this. Check the washer/dryer option box. You will go to the Southwest, because that’s what people in RVs do. Just like retirees flock to Florida, RV’ers flock to the Southwest. As soon as the MoHo keys are in your hand, you will feel an unexplainable, almost primal urge to see the Grand Canyon. There is no stopping the URGE. Some manage to delay it for a while, but all will eventually succumb. Prepare yourself. The southwest is BIG. It is WINDY. And it is DRY. Nevada, Arizona, and New Mexico each have their own appeal and their own unique scenery. From the Red Rock canyon in Las Vegas to the spires in Sedona to the pinon and buttes of New Mexico, each state is absolutely worth visiting. But don’t plan to cross the area quickly. Also, keep the weather in mind. In spite of the lack of snow, the Southwest is not a 12 month destination. We have all seen the pictures of snowbirds in Phoenix or Vegas, waiting out the winter under the sunny skies and palm trees. Well sure, that is a good idea, but keep in mind that you still have to get TO the Southwest and the places you might have to travel through can certainly experience bad weather. Spring can still be very cold – snowy even – in a lot of Arizona. Flagstaff, the natural top hat to Phoenix, is over 7,000 feet and has its own ski area! Imagine your surprise as you turn your MoHo into the worlds largest bobsled just outside Flagstaff when the weather report you looked at for Phoenix said it was 72 degrees. Once summer hits, the heat is brutal. I doubt most AC systems could keep the MoHo below 8o during the day in Phoenix in the summer. 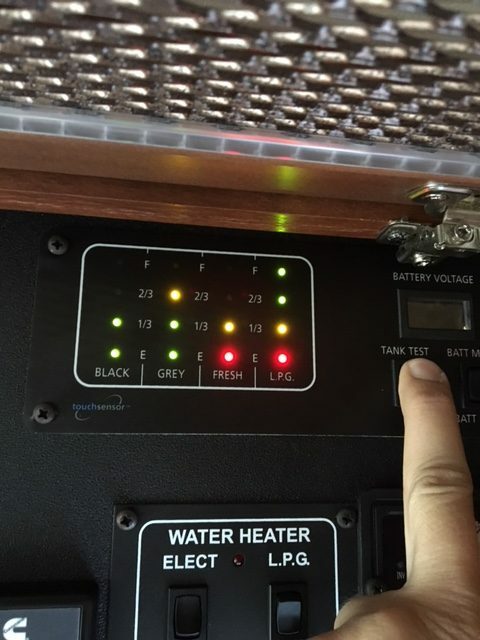 Many an RV’er has been surprised to have their coach overheat pulling up the mountain grades in the Arizona or Nevada heat. Pretty much all year it is dry – get ready for chapped lips and dry skin – and windy. Incessant wind blows fine grit into everything. Albuquerque was the worst for this, but Vegas and Meteor Crater were almost as bad. Wind gusts are a regular occurance in the Southwest. One minute it is relatively calm and then suddenly explosive wind appears out of nowhere. We often had to lower our dish and even put in our slides because of savage winds. NEVER leave your awning out if you aren’t 5 seconds away from the awning controls. Keep your eye on the weather at all times. Pull your awning it at the least hint of danger. If you do all these things, your awning is going to get ripped off. I think my next business will be awning repair in Albuquerque. Once we got to Kerrville Texas the wind gusting stopped. Lastly, if you look at a map, you’ll notice some funny little marks in all of the southwest states. Those are MOUNTAINS. Be prepared for steep climbs and steep descents. You will be glad you took my earlier advice and bought a diesel MoHo. If you didn’t take my advice, be very careful not to overheat your engine going up the mountains and your brakes going down the mountain. Pro tip: winters in the southwest may be easy, but the water is HARD. If you get your MoHo washed, make sure they use de-ionized or soft water. And watch out for sprinklers. People who do not live MoHo see little strips of grass in the RV campground and think “how nice.” People who do live MoHo see those as bright green warning signs saying “our sprinklers will overwater onto your MoHo every night you stay here and cover your paint job in water spots.” You can get little sprinkler deflectors at camping world. Or, you can put a plastic tub over the offending sprinkler head for a day or two. 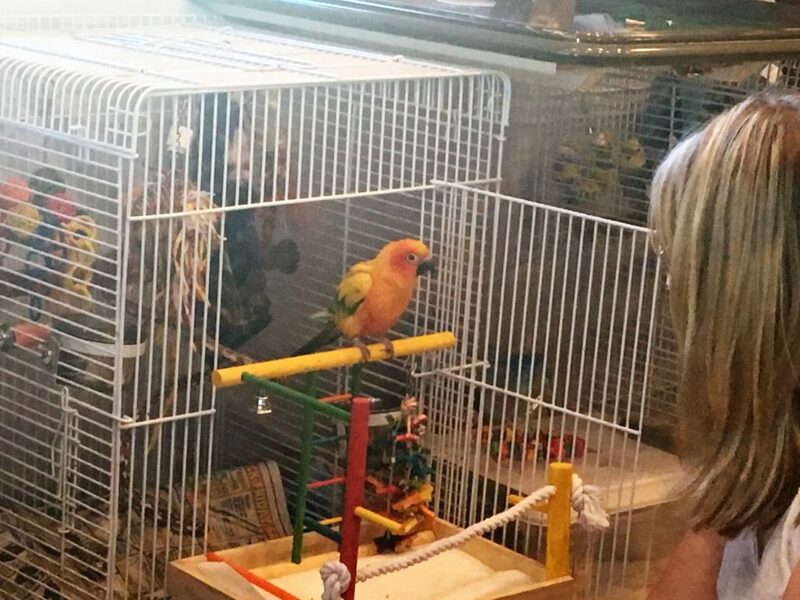 Our birds – and any pets – raise the stakes a bit. We can’t let the interior of the MoHo get too hot or too cold, which means we need to make sure that systems are programmed and backups are engaged. Normally RV’ers try to avoid harsh climates, but the RV is just a big car and it WILL heat up in the sun, or cool off a lot in the cold. Dishwashers seem like the least useful “luxury option. We did not get a dishwasher and not once have I been disappointed. . In fact, quite the opposite. Having been living in our MoHo for a while, I wouldn’t WANT a dishwasher. For starters, RV dishwashers are so small that they would have a hard time with larger pots/pans. Plus, with such small cabinets we don’t carry extra dishes so its not like we could let them pile up in a dishwasher. Instead, we would be running a load after every meal. Dishes have to be heavily pre-cleaned anyway; food remains going into the grey tank is a no-no. So it probably takes about as much time to just wash the dishes as it would to seriously pre-wash them. Lastly, that dishwasher will take up valuable storage space in the galley which is far more useful as drawers than it is as a dishwasher. Six: Mail is both easy and tricky. We first thought we would use a Texas mail forwarding, and setup our mail forwarding with Escapees based in Livinston TX. It is fairly simple to do this. First, we contacted the mail forwarding service and signed up. This got us an address in Texas. Next, we had to get a form from the US Postal Service which we authorize the mail service to handle our mail. That form (US Postal form 1583) must be signed and notarized. Notaries can be found at most FedEx and UPS stores, and some banks will do it too. Make sure you get instructions from your mail forwarding company on how to fill out the form because even though it is just a one-pager, it is kind of confusing. Once the form is filled out and notarized, send it to your new mail forwarding company. Once they receive it, the mail forwarding company is legally allowed to receive mail on your behalf. Lastly, fill out a change of address form with the US Postal Service. You can do this online and it is very simple. Tell the USPS you’ve moved to your new address and they take care of the rest! We had to do this twice since we ultimately decided to have Florida be our home base. So we had to cancel the Texas forwarding and set it up again for Florida. The good part is that once this is done, you will have an address you can use for any letter or package. The service will hold your mail until you contact them and tell them to ship it to you. So when we know we will be at a place in a week or so from today, we’ll contact the mail service and have our mail forwarded to meet us. They will re-forward packages too. In an emergency, we can even have them open a letter, scan it, and e-mail the scan to us! We leave money on deposit and that pays for the postage from the mail service to wherever we are. In practice, this works extremely well. However, it also means that several weeks – sometimes 3 weeks – go by before we end up getting our mail. This makes the random and unexpected paper bill a bit tricky because by the time we get the bill, it is due. E-bill is your friend while living MoHo. Deliveries are much easier. If you don’t have Amazon Prime, sign up immediately. We have all sorts of things shipped to us at our campgrounds, another benefit of not staying at a state park or BLM land. We filled our propane last in Gallup NM TWO MONTHS ago and it just now dropped from “full” to “2/3.” At this rate, I’ll fill the tank twice a year. Unless we use the propane furnaces, we barely use any propane and even the furnaces seem to be fairly low-use. Of course, our water heater is gas or electric but we use it on electric 99% of the time. Some of the new MoHos have chosen to go to a tankless water heater. The Berkshire line from Forest River, for example, only offers tankless heaters. At first this seems ideal – it saves space and weight while ensuring an endless supply of hot water. For families travelling on vacation, where 4-6 people all want to take a hot shower, tankless water heaters are probably the best option. 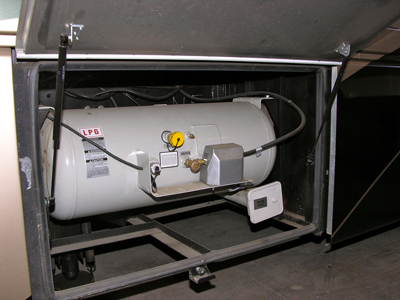 Unfortunately, unlike our water heater that can use electricy or propane (or both if we are in a big hurry) tankless water heaters use propane only. Think twice about that. Especially if its just two of you and you are full-timing. Electricity is usually free at campgrounds. Propane is definitely not free. A MoHo like ours is not ideal for boondocking. In spite of its massive holding tanks and fuel tanks, I would not want to be off the grid for very long. Especially the electric grid. White Rock had only electricity hookups and a single potable water fill and a single dump station. It was also paved. So we were boondocking with power, and that worked just great for us. We learned that while we use electricity all day long – particularly for the power-hungry air conditioners, we don’t use much water. We can go 5 days before the grey tank is full. That’s with daily showers, brushing teeth, making tea/coffee, washing dishes, etc. We did take a few “Navy showers” but still, we were clean. So 5 days without a water fillup was pretty easy. Unless it is laundry day, that is. 4 loads in the washing machine will fill the grey tank and empty the freshwater tank. I’m sure there is a relationship there – we are basically using the washing machine to transfer water from the fresh tank to the grey tank. The black tank would probably go 10 days before it got “full” but trust me – we would never let the black tank go unflushed that long. 7 days max and half that in hot climates. Without electricity hookups though, we’re running the generator almost immediately. Even banks of solar panels wouldn’t let us run the ACs. In cooler weather, we could probably get away with solar, but most places in the summer it just gets too hot. If we didn’t have pets that needed to stay cool, we could stretch – but not eliminate – the times when we leave AC off. Aside from that, our MoHo is too large and too heavy to go down narrow roads, and forget dirt roads or tight narrow curves. Our leveling jacks like a firm foundation. Our weight of 30,000 lbs makes us too heavy for most small – and often old -country bridges. For better or worse, we’re mostly going to stay at commercial campgrounds. There are too many items to check before driving away to keep in memory. Without a checklist, one of them will be missed. At best, whatever you miss will be minor. At worst, it will cause thousands of dollars in damage. Before we got our checklist, I drove across Sacramento with the Winegard dish still up and must have come within inches of ripping it off under a low bridge near Arden Fair mall. We have heard some crazy stories. One guy at a park told us that a guest drove out with his awning still out. Which was torn completely off as the guy drove out of the exit gate. We have heard of people driving away without unplugging the electric cord. Or the water hose. Or the sewer hose. Some people have driven off with their leveling jacks still down. Others have driven away with the parking brake on the tow vehicle engaged. Print the checklist or keep it on your smartphone. But use it. Ten: Set timers when filling/flushing tanks. At least twice I’ve started filling the freshwater tank and then got busy doing something else. Once, I started filling the freshwater tank – which can take 20 minutes – and then at some point I decided I needed to drive to the hardware store to get a part. So I did. When I came back, I noticed that a small pond was turning into a large pond under our MoHo. It took me a few seconds to realize what was happening…. Fortunately, the freshwater tank just drains out the fill holes and causes no damage. Except to my pride. Overfilling the black tank, on the other hand, would be pretty nasty. It takes 12-13 minutes to fill the black tank. When I’m flushing it, I first dump it, then set a timer for 11 minutes. Once the timer goes off, I go to the gauge and wait for the full light to start flickering. Then I go back outside and shutoff the water. The timer helps me not get distracted. We have been very pleasantly surprised to see that there are RV campgrounds everywhere. So many, in fact, that we often have to spend some serious time evaluating the options. Outside of major holidays (Memorial Day, 4th of July, Labor Day) we have never found campgrounds to be full. We have also never been told our 39′ Fleetwood is too large. I’d say that as long as you are under 40′, you won’t have a problem getting into any commercial campground. 1) places in remote areas, like Meteor Crater, do fill up because they are the only game in town. Meteor Crater is a double-whammy because it is both the only place to stay for Meteor Crater itself, and it is the only place to stop between Flagstaff and Winslow so a lot of people pull off for a night as they pass through. 2) some of the smaller campgrounds DO fill up, especially if they are in very desirable locations. 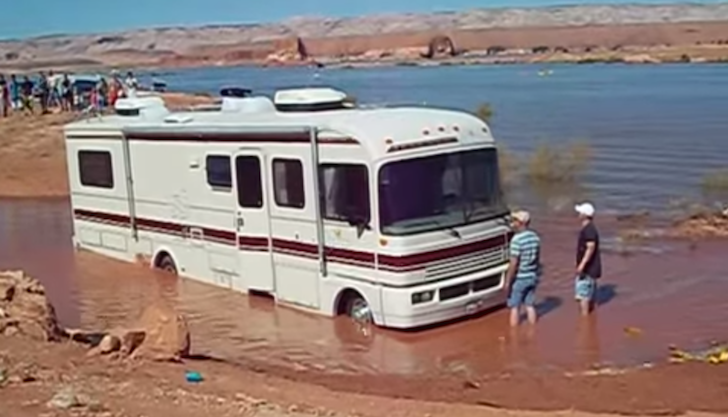 If that happens to us, we just find another campground a little further away. 3) State parks DO fill up, especially on weekends. Aside from BLM land – which are basically just large areas you can park out in the middle of nowhere overnight and nobody will stop you – state parks and national parks can be some of the MOST difficult to get a reservation. If you plan to stay at one of these, do get reservations early. Like a year early for the most popular parks and times. State parks also tend to have limits on stay (usually 14 days), so if you want to stay in an area longer than two weeks, you should consider a commercial campground. Good Sam membership has paid for itself many times over. Most RV parks accept Good Sam and will knock off 10% from the published daily rate. (Weekly/monthly rates rarely allow additional discounts). It only takes a few weeks of stays for that to recoup the membership. Also, Camping World is affiliated with Good Sam and you’ll get discounts there too. Camping World will become one of your new favorite stores. KOA memberships are worthwhile IF you stay more than about 15 nights at KOAs. We have stayed at two KOAs so far (Carlsbad and New Orleans) and that just about covered our membership costs. Unlike Good Sam, KOA membership only works at KOAs. I’m not opposed to KOA, and the one in New Orleans was very nice. I find them to be older, in general, so tighter roads and tighter spaces. Many have only back-in sites (vs. pull through), and they often have trees. Carlsbad KOA was the first and only place we have not been able to get the slides out because of trees. On the plus side, KOAs are often the last to fill up and can be a good backup option. Escapees has so far not been a big cost savings. We used their mail service for a few months, which I would also say was decent but not as useful as the Good Sam service we use now. The Escapees are super-friendly, but I never got notified that we had mail vs. Good Sam who not only send a daily summary when we get mail, but says who it is from and if it is a letter or package. I haven’t used the other Escapees services like the job board or trip planning. One campground DID offer a bigger discount for Escapees members than all the others, but that only happened once. When our box of mail comes from the mail service we feel like kids at Christmas looking at all the diferent envelopes. And like a lot of kids at Christmas who expected the box to be a Red Ryder BB gun with a compass in the stock and this thing which tells time but instead is pink bunny pajamas, we are often disappointed. Instead of sweepstake winning notice, our mail is mostly just bills and statements from companies that haven’t figured out how to deliver electronically. There was that one notice that I am entitled to 13 million from the UNIVERSITY Peacekeeping Fund but that came via email. Which leaves us with a big pile of paper that needs shredding. Since we don’t carry a shredder in the MoHo, and we don’t want these papers in the trash for some identity thief, they just sort of pile up. Or they did until we discovered Office Depot will shred papers for $1/pound!! So now we drop by Office Depot every month and just hand them our papers, and our $1, and walk out knowing the papers have been securely shredded! Nice! Wow, learning so much from you site and starting to get and itch to live MOHO too! !